Glencoe is well known for its hillwalking and climbing, but it’s also a great base for bikers as well. Whilst the glen itself offers limited biking opportunities, there’s plenty on the doorstep, with everything from long tours to extreme downhills. See our detailed route suggestions in the navigation box to the right of this page. Try exploring the quiet backwaters of Glencoe & Ballachulish villages. Alternatively there’s the infamous Devil’s Staircase or the downhill courses at the ski centres; Glencoe Mountain and nearby Nevis Range. All in all, some of the best mountain biking in Scotland. Home of Scotlands UCI Downhill World Cup venue since 2002. Which attracts crowds of up to 20,000 people every year. The downhill track is one of the most demanding and physical tracks on the world cup circuit although it is not a techically hard or steep track. But it is brutal on your bike and body. They also have a red downhill track accessed by gondola which is a combination of board walk, rock slabs and single track. They have recently added a beginner (green) and an intermediate (blue) downhill track which are good fun, with shuttles running at weekends. If trail riding or cross country mountain biking is more your thing there are several tracks in the Leanachan forest. There is the 2007 World Championship Cross Country track, No Fuss events 10 under the Ben, the witches trail. There has also been recent rounds of the Scottish Enduro Series held at Nevis Range. Go have a look in the forrest and see what trails you can find. 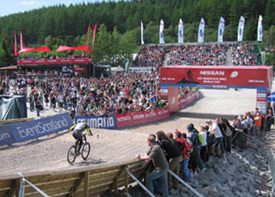 Glencoe Mountain hosts a round of the British Downhill Series annually on their steep, technical and very rocky track. They also have a far less intimidating red track which is also accessible via chairlift which can be ridin fairly comfortable on a trail bike. You can rent bikes from Glencoe Mountain to explore along the west highland way if you are after something more gentle. The more casual rider will enjoy some of the forest trails at Glenachulish, Duror or Inchree, or perhaps the 20 mile road trip around Loch Leven. The Island of Lismore is ideal for exploring by bike. 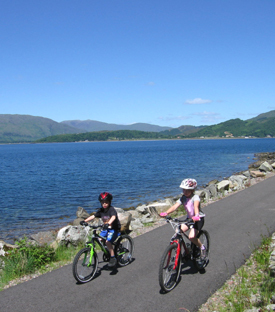 You can also explorer the cycle path which runs all the way from Glencoe to Oban along the side of Loch Leven, Loch Linnhe and Loch Creran. Off Beat Bikes is back! Fos and Nix have re-opened the original bike shop on the High Street. They were instrumental in helping make Fort William the Mountain Bike mecca it is today. Which has had a huge effect on the local area. Pop in and say hello when you are in Fort William then maybe head up Nevis Range and try out the world cup downhill track where you will race down the Off Beat Wall into the 4X track to finish off your run. Nevis Cycles in Inverlochy and Nevis Range, provide hire bikes from full on downhill bikes to hardtails for exploring the local area, spares and repairs and is run by keen cyclists. CrankItUp Gear offers bike hire along with some maintenance and sales in Glencoe village. Port Appin Bike Hire have a large stock of quality, professionally maintained bikes in all sizes for men, women and children. Helmets and backpacks are supplied free of hire charges with all bikes. Bikes are normally available on the day however during holiday periods it is best to phone a day in advance just to be on the safe side. 01631 730391. Prices are around £7 per half-day hire, and £10 per full-day hire. No Fuss Events have organised a series of classic mountain bike events in the area, including 10 under the Ben and the Relentless 24. The local bike club, West Highland Wheelers, is very active and was the driving force behind the establishment of the Downhill Course at Nevis Range. They run a series of (fun!) races and time trials throughout the year in which visitors are welcome to participate. Clachaig Inn offers bike storage facilities, as well as a work bench and a few tools should you need to make a few running repairs, a service which is also available to guests of Clachaig Self Catering Holidays. Clachaig is also recognised by VisitScotland’s ‘Cyclist’s Welcome’ Scheme. We’ve put together a few route descriptions (right navigation) which we hope will inspire you to head off and explore the hidden corners of Lochaber. Whilst not intended to be a comprehensive route guide, the routes should be apparent, especially when viewed in conjunction with a O.S. map. For more route information in the area, try Ride Fort William. Fun in the forest. Some local biking in the forest at Ballachulish village. Brecklet Blue. Let the good times roll… from Ed Daynes on Vimeo. Riding the Witches Trail in Leacnachan Forest. Roll With It from Ed Daynes on Vimeo.